With June being declared by President Barack Obama as African American Music Appreciation Month (Black Music Month), the National Museum of African American Music (NMAAM) announced today significant financial support along with its new Rivers of Rhythm® Digital Exhibition. This first-of-its-kind digital exhibition was revealed by museum officials and award-winning gospel artist, CeCe Winans, who was recently announced as one of NMAAM’s National Chairs. The museum unveiled the digital exhibition at a press conference at Belmont University in the lobby of the Johnson Center, home to the Curb College of Entertainment and Music Business. As a National Chair, Winans will focus her efforts for NMAAM specifically around the gospel genre and serve as an active ambassador, providing support in the form of appearances and access to her professional network for the organization. She–along with Darius Rucker, Keb’ Mo’ and India.Arie–were announced earlier this year and are actively engaged in the project. All are prominently featured in the Rivers of Rhythm® Digital Exhibition (RofR). NMAAM and Belmont also announced that the University had provided a $250,000 donation to the museum to sponsor the digital exhibition. NMAAM is proud to announce its first-ever digital exhibition during the National observance of Black Music Month (or African American Music Appreciation Month). “This June and every June, we celebrate Black Music as a vital part of our Nation’s proud heritage. African-American music exemplifies the creative spirit at the heart of American identity and is among the most innovative and powerful art the world has ever known,” said President Obama in presenting this year’s federal proclamation. 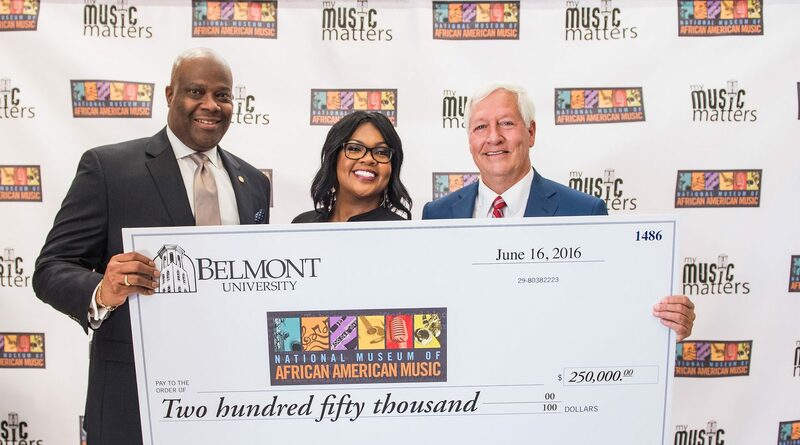 This announcement was live streamed on Periscope via @theNMAAM and on Facebook via @BelmontUniversity. CeCe Winans is a multi-talented singer, who has won numerous awards, including ten GRAMMY® Awards and seven Stellar Awards. She has sold twelve million records worldwide. CeCe is also the best-selling female gospel artist of all time. CeCe’s collection of Top Ten R&B radio hits include “Count On Me,” her duet with Whitney Houston, from the Waiting to Exhale soundtrack. The single was certified Gold in the US and reached No. 8 on the Billboard Hot 100, No. 4 on the Adult Contemporary chart and No. 8 on the Billboard R&B Singles charts. As the only museum dedicated to all dimensions of African American music, The National Museum of African American Music (NMAAM) will showcase over 50 music genres created or impacted by African Americans, honor the legacy and legends of this diverse music and detail the impact music has on musicians and consumers around the world. NMAAM will draw upon a range of music and history enthusiasts to explore and celebrate American music and will tell a story never before told, until now.